The Loft Flat has two bedrooms, one with a double bed, the other has twin beds that can be converted to a kingsize bed on request. The sleeper couch in the lounge is available for small children, or one bigger child. There is a small kitchen with everything that a guest would need, plus a two-plate stove. 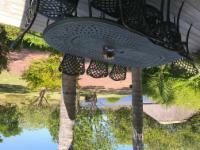 The patio, which has a wonderful view, has outside furniture, and a braai area. It enjoys privacy and has a sunny aspect, as the sun sets along the river. The evenings are often spectacular, with the reflections of the sunset on the water. The Garden Flat situated on the ground floor easily accessible from the car park has two bedrooms, one en-suite with two singles or a double bed, the other a queen size bed. There is another shower and toilet off the living room which has a sleeper couch. The kitchenette is fitted with a full size hob and oven, fridge and microwave, leading onto a beautiful sun deck with a view of the river, braai area on the banks. Moonriver is hugely popular with twitchers, as there are many migratory and endemic species to be seen. Guests can walk along the river's edge to the end of the property. They might be lucky enough to spot the elusive Cape Clawless otter—there is plenty of evidence of them! The river is lovely to swim in, provided one doesn’t mind a bit of mud between the toes! One can paddle quite far up-and down-river on the kayak.The attractions of Crags, such as the wine farms and animal and sanctuaries, are within easy reach as is Keurbooms beach. Beach: This unit is not far from the beach. Check in is at 14:00, unless otherwise arranged. Departure at 10:00 in morning. The atmosphere is so relaxing and the view is just great.The place is well kept and neat.Will recomend to other visitors.Thank you for a nice stay. Moonriver is 1km from the centre of Rietvlei Bitou Valley , the nearest airport 111.1km (George Airport).